By GreenEyedLillies on December 16th, 2008 . Filed under: Home Decor . This is a 3 piece magnetic set featuring large wooden spring loaded clothespins,(3 1/4″ x 3/8″), embellished with beautiful patterned papers and a fun cupcake on each one! I have sanded, inked and sealed each individual clip so that it will last a long time and be of good use. Please note that these have been sealed but are not waterproof. Place a clip on any metal surface…your refrigerator, locker, metal message board, etc. Display photos, artwork, coupons, to do lists, memos and more. These can also be used to clip things together such as mail, chip bags and anything that needs to be put in its place. Just clip it back on the fridge or memo board when you are done using it! 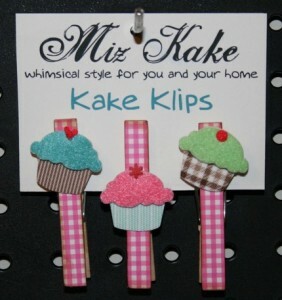 These make perfect gifts for a baker, cupcake lover or just for yourself!